Holocaust Controversies: A document that forced Mattogno to claim "forgery"
A document that forced Mattogno to claim "forgery"
OKW beabsichtigt die Mitnahme von Waren aus dem GG dahin zu regeln, dass der persönliche Reisebedarf und die zur Mitnahme zugelassenen Waren frei von jeglicher Abgabe bleiben. OK Ostrow meldet, dass die Juden in Treblinka nicht ausreichend beerdigt seien und infolgedessen ein unerträglicher Kadavergeruch die Luft verpestet. Army High Command intends to rule the taking along of merchandise from the General Government in such a way that the personal travel accessories and the merchandise allowed to be taken along will be free of any duty. The recording of this intent, whose implementation would have been welcomed by military personnel on leave from the General Government, is without interest to the subject matter of this blog. OK Ostrow reports that the Jews in Treblinka are not sufficiently buried and as a result an unbearable smell of cadavers pollutes the air. The crucial sentence conveys the immediate message that at the time of the entry there were more corpses of Jews at Treblinka than could be adequately buried, and that this led to smell pollution serious enough for the OK (Ortskommandant, local commandant) at Ostrów, a town 20 kilometers away from Treblinka, to report this as a problem that he wanted something to be done about. It is also independent corroboration of various eyewitness testimonies describing the stench of corpses that could be noticed far away from Treblinka extermination camp. The smell was infernal because gas was constantly escaping. It stank horribly for miles around. You could smell it everywhere. It depended on the wind. The stink was carried on the wind. Understand? But, you must imagine what it was like living here: every day, as of the early morning, these hours of horror when the trains arrived, and all the time - after the very first days - this odour, this dark foggy cloud that hung over us, that covered the sky in that hot and beautiful summer, even on the most brilliant days - not a rain-cloud promising relief from the heat, but an almost sulphuric darkness bringing with it this pestilential smell. Eventually our train followed the other train and we continued to see corpses on both sides of the track - children and others. 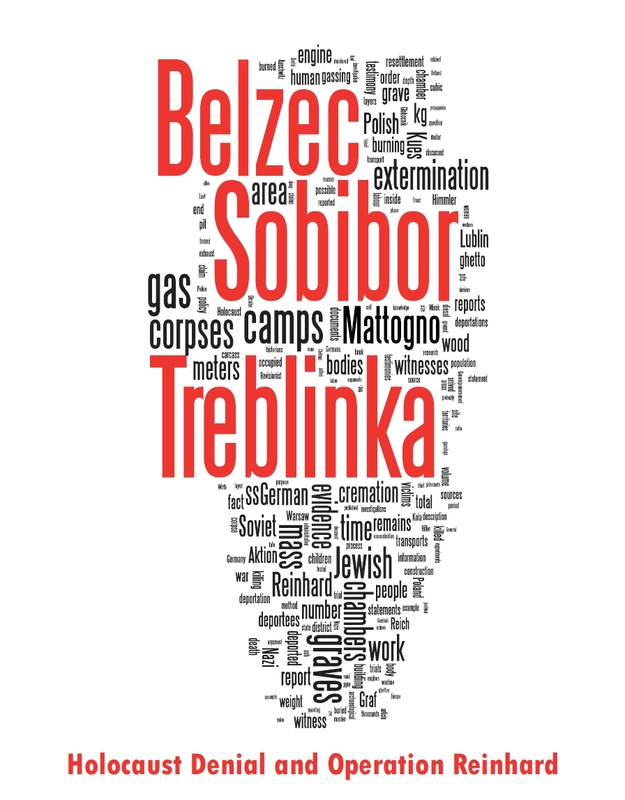 They say Treblinka is a ‘delousing camp’. When we reach Treblinka station the train is next to us again - there is such an awful smell of decomposing corpses in the station, some of us vomit. None of these witnesses was aware of the aforementioned entry in the War Diary. Mattogno’s first approach as concerns this inconvenient document was trying to explain it away. In his co-production with Jürgen Graf about Treblinka, Mattogno had argued that the few hundred bodies found by the Soviets and Poles in mass graves in the area of the Treblinka I labor camp were "the bodies of all – or nearly all – who died there", and that the violation of these mass graves "alleged" by judge Łukaszkiewicz was "presumably done in order to be able to exaggerate the number of victims of Treblinka I". Łukaszkiewicz had estimated that at least 6,500 people had been buried in 41 mass graves found in the area of the Treblinka I labor camp. When it came to explaining the "unbearable smell of cadavers" reported by the OK Ostrów, Mattogno dropped his professed skepticism regarding Łukaszkiewicz’s estimate and argued that "nothing excludes that the document in question referred to the abovementioned 6,800 corpses buried near Treblinka I". Actually it can be safely excluded that the OK Ostrów’s complaint about an unbearable stench of corpses emanating from insufficiently buried Jews had anything to do with the cemetery of the Treblinka I labor camp. As I pointed out in an earlier blog, the Treblinka I labor camp existed from November 1941 to late July 1944, i.e. for about 32 months or 960 days. It is assumed to have taken the lives of about 10,000 inmates by historians, 6,800 (or 6,500, see below) by Mattogno, which would mean an average mortality rate of 7 to 10 per day. So Mattogno was asking his readers to believe that a daily average of only 7 to 10 bodies could not have been buried deeply enough, and that their decomposition released such a high amount of foul gasses that the smell thereof disturbed the camp's neighbors miles away. Having obviously realized that this dog wouldn’t hunt, Mattogno turned to questioning the authenticity of the diary entry in question. Claiming forgery is not something Mattogno will readily do in regard to an exhibit of documentary evidence, presumably because he is aware that doing so implies acknowledging that such exhibit is incriminating and runs counter to the "Revisionist" canon. Now, what arguments does Mattogno present in support of his forgery contention? First of all, he claims that the entry contains two unlikely elements, one being the reference to the Jews: "If the purpose of the protest was to have the bodies buried in a more adequate manner, there would have been no need to introduce this "bavure" (slip) to borrow a term from Pressac" . This is a rather weak argument. The entry in question is one of two entries for the date 24.10.1942, on a page that contains entries about other matters for a period between 20.10.1942 and 25.10.1942, of an internal document that was kept in its place, not one that was sent around. The entry in question, mingled with entries about innocuous matters in a page of a book containing lots of similarly innocuous entries, is also not exactly an eye-catcher, so one wonders what forger would (by typing an additional entry into what would have been an unusually large blank space below the first entry for 24 October 1942, taking care to use the same typescript) have given himself the trouble of creating so inconspicuous a "smoking gun", only to then leave it buried in some archive until some historian happened to discover it. That alone makes Mattogno’s forgery insinuations rather improbable. And what’s the deal with the use of the term "Jews"? The person keeping the diary was recording the OK Ostrów’s verbal complaint as it had been made: the Jews in Treblinka were not sufficiently buried, therefore a stench of corpses befouled the air, and that stench was unbearable (so something had to be done about it). There’s nothing incriminating about the mention of Jews per se; Jews might be Jewish inmates of a labor camp. 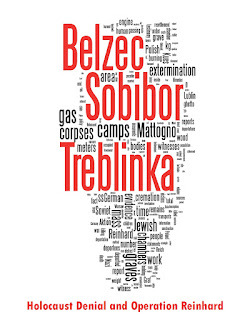 What makes the entry incriminating, and thus uncomfortable for Mattogno to the point of his knowing no better than to claim forgery, is the information that there was a place called Treblinka where there was an enormous number of corpses, so many that they couldn’t be sufficiently buried and their decomposition generated a stench that was perceived as unbearable even at some distance from the place, or else the Ostrów commandant wouldn’t have complained. What kind of place in this particular area, which was far away from the front or any bombed-out city, and not being visited by any monstrous epidemic, could that possibly have been under the circumstances, other than a place where people were being murdered in large numbers? The entry would be just as incriminating if the person in charge of the diary has used the term "Leichen" (corpses) instead of "Juden" (Jews). Mattogno’s second argument against the entry’s authenticity is just as feeble. Apparently hoping that his readers might mistake it for an argument, he asks a rhetorical question: "Can it seriously be believed that, even with a favorable wind, the smell carried from Treblinka could have been experienced at this distance as "unbearable [unerträglich]"? Southern California awoke Monday morning to a foul odor that wouldn’t go away. Residents clogged 911 lines with calls, prompting health officials from Ventura County to Palm Springs to send out investigators looking for everything from a toxic spill to a sewer plant leak. It turned out the stink originated nearly 50 miles south of Columbus, at the Glatfelter paper plant in Chillicothe. Ohio Environmental Protection Agency spokeswoman Heidi Griesmer said the plant was performing maintenance early today when a venting system failed, offending everyone for miles. While it's not confirmed yet, there's a chance the smell could be traveling from the Western Placer Waste Management Authority. Some Rocklin residents -- who live about six miles from the facility -- said they noticed the strong scent lingering this weekend. The above examples don’t prove that the stench of hundreds of thousands of insufficiently buried corpses could be perceived as unbearable as far as 20 kilometers downwind, but they do suggest that this was possible. As Mattogno bears the burden of proving the impossibility of such phenomenon but offers merely a feeble appeal to incredulity, that’s enough to destroy his argument. Besides, the fact the OK Ostrów reported the stench does not necessarily imply that he smelled it at his command post in Ostrów. It is also possible that he took notice of it on a tour of the area as he got closer to Treblinka, or that it was reported to him by subordinates, German officials or civilians in the area of his jurisdiction. Mattogno asks why the cadaverous stench became unbearable only towards the end of October 1942. Who said so? Certainly not Franz Suchomel, Franz Stangl, Franciszek Zabiecki and Hubert Pfoch, among other witnesses who were bothered by the stench in August 1942 already (including one witness later mentioned by Mattogno himself). The fact that only one documentary record mentioning the stench has been found only means that, bar eventual future finds in archives not yet completely explored, only one recorded complaint about the stench survived the war. There may have been other records that were later destroyed, and there may have been reports or complaints about the stench that went unrecorded. It is even possible that the OK Ostrów, after having called attention to the problem several times to no avail, insisted that his complaint on 24 October 1942 be taken on record, in the hope that this would finally lead to something being done. That said, it is also a fact that October 1942 was the most killing-intensive month in the history of Treblinka extermination camp. Over 200,000 additional corpses in that month alone, on top of the hundreds of thousands already buried before, might well have led to graves being overfilled as grave space became scarce, as is suggested by eyewitness testimonies mentioning cremation attempts in November 1942. The corpses of the gassed – as already mentioned – were buried in the camp in huge graves, which were filled in with earth. The results were sensed first in the surrounding area closest to Treblinka and, later, in places further away. On 11 August (a date I will not forget) we sensed for the first time the terrible smell from the corpses, which the south wind brought to Treblinka. According to orthodox holocaust historiography, some 150,000 Jews were gassed and buried at Treblinka as of 10 August 1942, so that the fact that Królikowski, at a distance of 3 or 4 km from the Treblinka "extermination camp," sensed this cadaverous stench for the first time on the 11th of this month appears rather problematic, even more so than the notion that the Wehrmacht soldiers stationed in Ostrów Mazowiecki, some 20 km away from the camp, smelled it at the end of October. Mattogno doesn’t reveal what work of "orthodox holocaust historiography" exactly he took his figure from, but according to the correspondence between the Secretary of State in the Reich Ministry of Transport, Dr. Eng. Ganzenmüller, and the head of Himmler’s personal staff, SS-Obergruppenführer Karl Wolff, 5,000 Jews went from Warsaw via Malkinia to Treblinka every day starting 22 July 1942, so that by 10 August 100,000 Jews should have arrived at their final destination from Warsaw alone. There were also transports from other places of origin. A calculation I made based on Sara Berger’s list of transports to Treblinka suggests that the camp had accrued about 126,000 corpses by 10 August 1942. For someone outside the camp to smell the decomposition stench of these corpses, two factors had to be present: there had to be many corpses in the upper layers of the mass grave(s) closer to the top, and these corpses had to be in a state of putrefaction (which occurs between days 4 and 10 after death in the open, and during which foul-smelling gases such as hydrogen sulphide, methane, cadaverine and putrescine are produced) . Corpses buried early in the period from 22 July to 10 August 1942 would be lying in the lower layers of the grave or graves in which they were buried, and perception of their smell from the outside would additionally be somewhat attenuated by sand and chlorinated lime poured over each layer of corpses. Corpses in the upper layers would be those of people killed (or dead on arrival) closer to the date mentioned by Królikowski, and it would be mainly the decomposition stench of these corpses that the witness would notice when the wind blew it in his direction, which need not have happened every day. So Królikowski’s recollection is entirely plausible, while the same cannot be said of Mattogno’s "transit camp" fantasies. As to whether the stench carried further than the 3 or 4 kilometers from the camp where Królikowski stood, there is nothing in the witness’s account to belie that notion, and the witness expressly stated that the "results" of the killing – by which he apparently meant the stench – "were sensed first in the surrounding area closest to Treblinka and, later, in places further away". This statement suggests that either Królikowski himself or people he talked to also noticed the stench at distances larger than 3 – 4 kilometers. Mattogno’s last shot against the uncomfortable War Diary entry comes in one of the chapters dedicated to this humble writer’s contribution to the HC critique, which will be addressed in detail in upcoming blogs. 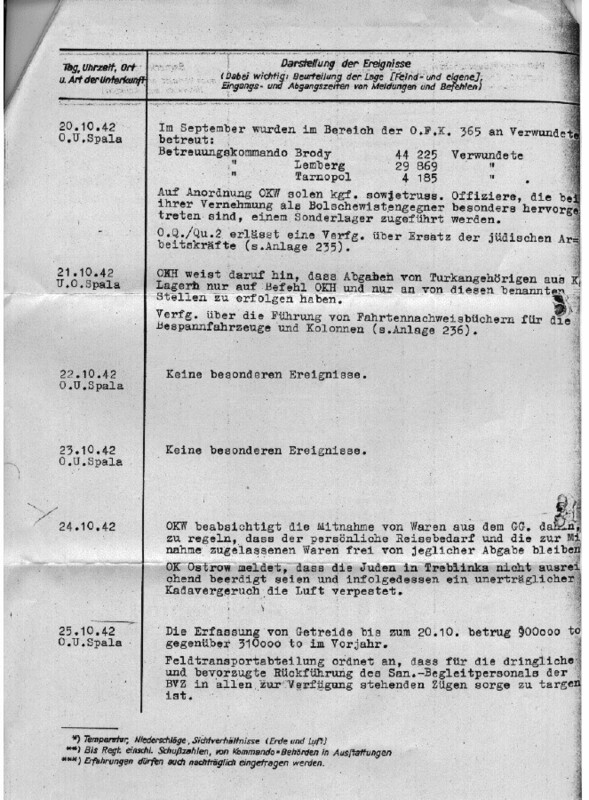 A "Wehrmacht letter (Wehrmacht-Brief) dated "Treblinka, 10 September 1943 [Treblinka, den 10. September 1943]" regarding the delivery of a railway car of chlorinated lime to the "SS-Arbeitslager Lublin"" allows Mattogno to "infer that in Treblinka the chlorinated lime (Chlorkalk) was used in adequate quantities in the mass graves", as the chlorinated line is "evidently the remnant of a previous delivery". In Mattogno’s book, the letter in question indicates that the Treblinka "transit camp" had sufficient chlorinated lime at its disposal to keep the stench of the corpses’ decomposition from bothering the neighborhood, so much of the substance that some was left over towards the end of the camp’s operation. However, the fact that Treblinka had leftover chlorinated lime in September 1943 may also have been due to shipments of the substance arriving after cremation had replaced burial as a body disposal method and/or the clearing of the graves and cremation of the corpses had commenced. Such chlorinated lime would thus have no more use at the time the shipment arrived, and be left over for shipment to the SS labor camp at Lublin. This explanation is not only plausible by itself, but has the elementary advantage of being in accordance with all available evidence, whereas Mattogno’s inference is not. So it can be concluded that Mattogno has neither a plausible alternative explanation for the "unbearable stench of cadavers" recorded as emanating from Treblinka (his attempt to blame that stench on a mere 6,500 corpses buried over a period of about 32 months is quite ridiculous), nor a relevant argument against the authenticity of the War Diary entry of 24 October 1942 whereby the local commandant in Ostrów complained that the Jews in Treblinka were insufficiently buried and therefore an unbearable smell of corpses befouled the air. All he has achieved is to unwittingly acknowledge that said entry is documentary evidence supporting other evidence whereby mass killing on an enormous scale was conducted at Treblinka. The image was taken from the provisional draught of Stephen Potyondi’s article "Final Destination Treblinka" on "The Phora" forum ([link]). Potyondi took the image from the Nizkor website, where it is featured under http://www.nizkor.org/ftp.cgi/camps/ftp.cgi?camps//aktion.reinhard/treblinka/images/ostrow2.jpg but currently not available. 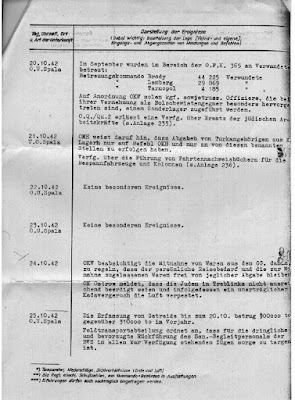 According to the related reference (http://www.nizkor.org/ftp.cgi/camps/ftp.cgi?camps//aktion.reinhard/treblinka/images/ostrow2.ref), a copy of the document was made available to Danny Keren by the Militärarchiv (Bundesarchiv, Abt. Militärarchiv - [link]) in Freiburg, Germany. Lanzmann, Claude, Shoah: An Oral History of the Holocaust, Pantheon Books, New York, 1985. A transcript of the interview with Suchomel is available on the Nizkor website under [link]. Lanzmann’s interview with Suchomel can also be viewed on Youtube under [link]. Gitta Sereny, Into that Darkness. From Mercy Killing to Mass Murder, 1974 McGraw-Hill Book Company, New York, p. 157. Sereny, as above, p. 155. Sereny, as above, p. 159. Carlo Mattogno, Jürgen Graf, Treblinka. Extermination Camp or Transit Camp?, 2004 Theses & Dissertations Press, Chicago, pp. 88-89. Carlo Mattogno, "Belzec or the Holocaust Controversy of Roberto Muehlenkamp" ([link]). Mattogno refers to his "nothing excludes that the document in question referred to the abovementioned 6,800 corpses buried near Treblinka I" - argument (pointing out that the correct number is 6,500 instead of 6,800) on page 1099 of Mattogno, Graf and Kues’ lengthy magnum opus with the lengthy title The “Extermination Camps” Of “Aktion Reinhardt”. An Analysis and Refutation of Factitious “Evidence,” Deceptions and Flawed Argumentation of the “Holocaust Controversies” Bloggers, 2013 Castle Hill Publishers, UK. However, he doesn’t mention let alone address my refutation of that argument. See notes 338 and 339 in that article ([link]). "Ambiente: População continua a queixar-se do mau cheiro da lixeira de Trajouce" ("Environment: Population keeps complaining about the bad smell from the Trajouce landfill") ([link]). The distance between Porto Salvo and Trajouce is 7.7 km by car or 4 km by air ([link]). Sara Berger, Experten der Vernichtung. Das T4-Reinhardt Netzwerk in den Lagern Belzec, Sobibor und Treblinka, 2013 Hamburger Edition, p. 254. According to the table on that page, 211,600 – 234,600 people were killed at Treblinka in October 1942, more than in any other month. See the blog "The Clueless Duo and early corpse incineration in Treblinka and Belzec", by Sergey Romanov ([link]). One of the testimonies addressed therein, that of Richard Glazar, quotes rumors whereby the corpses were being burned because "There’s not enough room to bury them". Mattogno’s lengthy rambling in the magnum opus against witnesses mentioning early corpse incineration at Treblinka (especially Rajzman) will be addressed in another blog. Experten der Vernichtung, pp. 427 to 431. Where numbers are given for a larger period (e.g. 186,200 to 199,500 deportees from Warsaw between 22.7 and 18.8 and between 25.8 and 27.8.1942) I divided the lower number by the number of days in the period. As explained in the blog "Challenge to Supporters of the Revisionist Transit Camp Theory" ([link]), names of "transited" Jews would be all over the place if the "transit camp" theory were more than hollow humbug, but not a single such name has become known in over seven decades since the Aktion Reinhard(t) camps were closed down. The challenge to provide one such name (with proof) is hereby extended to Mr. Mattogno. It's not a forgery. Any real forger would make it sound as incriminating and explicit as possible. For example, it would state that Jews are being killed with Gas under Hitler's orders. Nope. The fact that it's circumstantial rather than direct evidence undermines any claims about Forgery. Deniers often want documentary evidence to back up witness statements. When this is provided they scream "forgery!!!" at the top of their lungs. It is impossible to make some people happy. If the Holocaust is a hoax it is the most complex conspiracy in the history of the world, with tons of forged documents, thousands of intimidated witnesses, thousands of tortured alleged perpetrators and skillfully faked recreations at Auschwitz and Majdanek. All to create Isreal, a small Middle-Eastern state that as far as I know, has no significant natural resources. "As a result of starvation and living in cold barracks during the winter of 1942-43, an epidemic of typhus broke out." This won't make much difference to your average daily death rate at T1, but you still forgot it: A typhus epidemic hit T1 in the winter of 43/44 [see Mattogno, Treb., p.89]. 148 deaths recorded between November 12 to December 20. What's the rabbit trying to tell us? That 148 typhus deaths at T1 in the winter of 43/44 would issue a stench perceived as unbearable miles away in October of 1942? The black dumbass is trying to tell us he's grasping at straws, as usual. I think the rabbit was suggesting the Typhus outbreak of 1942-43 was the cause of an increased death rate at Treblinka and therefore the great stench came about from this. The additional info he supplied us re Typhus at T1 in 43/44 contributed nothing to the discussion, which resulted in the above piece of witty sarcasm from Roberto. Mind you, if the carrot cruncher is implying he has found the source of the stench, then someone better inform Mattogno, for it is he who appears to be kicking up a stink regarding the documents authenticity, in which case he probably believes their wasn't a stink in the first place ! Mattogno neglects to recall that the document was uncovered after the war, in the fifties or sixties IIRC. Were it a forgery it would have been produced with a flourish at the IMT. Also: the document contains other passages about the need to improve conditions in a Heer Work camp somewhere in the area, and makes reference to a commission being formed by Polish prisoners, which would not have made it onto a forgery. I know this because some dumbass used said passages to try to prove that they referred to Treblinka when they clearly did not. And last time I checked, October is not a winter month. I don't know what the seasons are like in East Londontown, but "winter 42-43" refers to December-February in most definitions. Both the rabbit and Mattogno look like tools here. It has been reported by "eyewitnesses" that many Jews arrived to Treblinka dead already (see "Trap with a Green Frence, by Richard Glazar). Jews also were reported to have died during a typhus epidemic at Treblinka in the winter of 1942-43 (see same reference). It doesn't take a whole lot of bodies to stink up a place. When I wrote "monstrous epidemic", I wasn't thinking about a typhus outbreak among the relatively small population of a camp like Treblinka, of course. I had something like the Black Death in mind. To stink up a place is one thing, to stink miles away from that place is another. Funny that the poster accepts Richard Glazar's testimony as evidence when it comes do Jews dead on arrival and typhus but not as concerns mass killing. Except, of course, that those who "died of those means" wouldn't have been so large in number that they couldn't have been properly buried within a short time, unless of course every train arrived full of dead bodies, which would mean mass murder by means other than gassing and be just as bad. Burying up to 200,000 corpses or more every month was a different problem, however. Mattogno obviously considered the document to be evidence to large-scale mass murder, after his pathetic attempt to blame the stench on the pits of Treblinka I had failed. Hence his equally pathetic attempt to dispute its authenticity. As we're at it, there's no point in playing the deniers' game and trying to provide them with the one smoking gun that proves everything. There's no such thing as a piece of evidence that by itself proves any historical event or phenomenon. Historians work by piecing together various elements of evidence independent of each other - demographic data, physical finds, documents and eyewitnesses (if someone asks whether the Holocaust can be proven without recourse to "dubious" eyewitness testimonies, a good counter-question would be what historical event, namely what mass murder of similar magnitude, has ever been proven without recourse to eyewitness testimonies that are always "dubious" in one way or another, for the simple reason that human memory is fallible). here, names of surviving "transited" Jews should be all over the place. Yet while the names of a large number of AR victims have been established (e.g. the Dutch Jews deported to Sobibór), not a single name of a "transited" Jew has ever become known, more than seven decades after the AR camps were closed down. In the chaos that occurred after the camp opened (the camp received more trains than it could "process") the guards resorted to shooting instead of gassing. Stangl reported the stench as he was driving in to take command. He also reported that as he drove in he saw bodies before driving into the main camp. This was in August of 1942. So yes, absolutely some of the Jews died by other means than gassing. Undoubtedly some died on the way, some died by shooting, some died of epidemics. A large percentage died by gassing so, sorry, you failed. "It doesn't take a lot of bodies to stink up a place"
Are you saying that the efficient Germans couldn't dispose of a few bodies so that they wouldn't stink or cause environmental issues? If it is a matter of a few hundred bodies that's easy to take of, right? Hell, the NKVD buried 4,000 Polish Officers at Katyn. I've never heard of an issue with the stench of those bodies, the Germans found out because Polish villagers told them about the activity at the sight, not because of the stench. bobby: What's the rabbit trying to tell us? Nope. You're having reading comprehension issues again. DasBrum partially understood at least. DasBrum The additional info he supplied us re Typhus at T1 in 43/44 contributed nothing to the discussion, which resulted in the above piece of witty sarcasm from Roberto. If you re-read the mule's post, you'll see he calculates an average daily death rate for T1. The additional info I supplied was something he didn't leverage for in his sums. R Kelly: "Hell, the NKVD buried 4,000 Polish Officers at Katyn. I've never heard of an issue with the stench of those bodies, the Germans found out because Polish villagers told them about the activity at the sight, not because of the stench." Polish villagers? In Smolensk!? lol, You're as bad as Caroline Sturdy-Colls who believes Katyn was "within the Soviet-occupied zone". Polish labourers, employed by OT, are reported to have learnt of the shootings at Katyn from Russian villagers, and passed that info onto the Germans. Who initially did nothing about it. DR. STAHMER [Turning to the witness.] After your arrival at Katyn, did you notice that there was a grave mound in the woods at Katyn? [Colonel Freidich] AHRENS: Shortly after I arrived-the ground was covered by snow-one of my soldiers pointed out to me that at a certain spot there was some sort of a mound, which one could hardly describe as such, on which there was a birch cross. I have seen that birch cross. In the course of 1942 my soldiers kept telling me that here in our woods shootings were supposed to have taken place, but at first I did not pay any attention to it. However, in the summer of 1942 this topic was referred to in an order of the army group later commanded by General Von Harsdorff. He told me that he had also heard about it. Oh, so sorry fluffy bunny, I misspoke. By the way, as long as we are conversing, what made you come up with "Black Rabbit of Inle"? I recognize it from "Watership Down," a beloved book from my childhood. Back on topic, are you saying that 4,000 wouldn't stink? Or that the Soviets were better at concealment? I'll grant you they had more practice. I'd think the intelligent, advanced Germans could get rid of a few hundred bodies without stinking up the joint. Many years ago I started using the Black Rabbit of Inlé as an online moniker, can't remember why exactly. But I was a big fan of the film as a kid, I'm fan of the book too, although I was an adult before I got round to reading it. Anyway, I imagine the argument is that the graves in T2 were open, and filled with more bodies, hence why there were complaints about the smell, which apparently (to my knowledge) there weren't about Katyn, although it was winter when the Germans discovered Katyn. «bobby: What's the rabbit trying to tell us? And the impact of the rabbit's blather on my argument that the stench couldn't have come from Treblinka I is exactly zero. The Daft Rabbit tried to pass off some bodies form a typhus outbreak in the Winter of 42-43 as the reason for the smell. Pathetic in that the report was from some months beforehand. Also: Ostrow, IIRC is almost 20KM away from Treblinka as the crow flies, so a few dead bodies from an imaginary outbreak will not produce that level of stench.